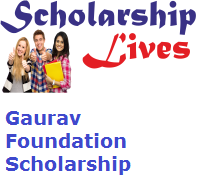 If you are looking for Scholarship after 12th Class then you are on right webpage because Gaurav Foundation Scholarship 2019 Application Form is available now for all 12th Class pass students and above going for higher education. The main objective of the Foundation is to provide the tuition fee assistance up to INR 10 Lac to deserving and brilliant hardworking Applicants. Applicants must be Indian and must not hold any other Countries Passport. Scholarship Amount: Shortlisted candidates will get scholarship assistance amount of up to INR 3 Lac for pursuing courses in India and up to INR 10 Lac for pursuing courses abroad. Application Form must be filled in black or blue ink Capital Letters only. And send to the email id which is mention below and sent to the above-mentioned E-mail Address ONLY within 5 working days after the CLEARANCE OF THE DEMAND DRAFT. Fill accurately details like Applicants Name, Gender, and Date of Birth Pre-Printed as mentioned on this Form. The form cannot be changed, recreated or transferred or photocopied to any other applicant. Making a Request Form or Scholarship Application does not give any assurance for the scholarship. Application fees shall not be refunded under any circumstances. Check the eligibility criteria which are mention above. Very Important Note: It roughly takes 2-3 Working Days to complete the process (verify the transaction) and sends the application form through Email (on your registered email address).